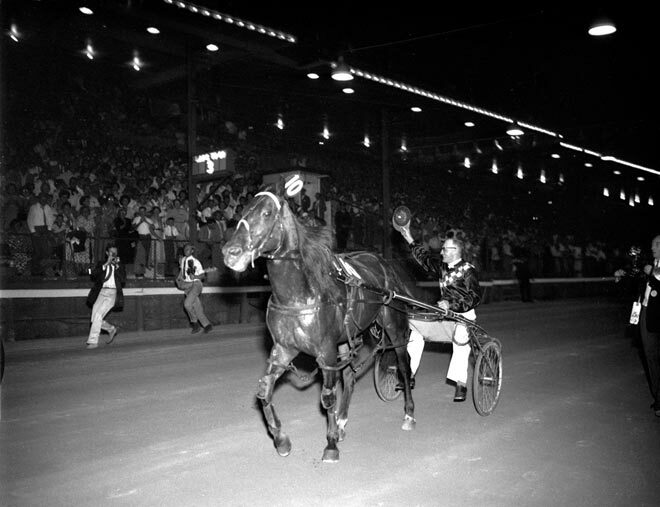 Caduceus wins the 1960 Inter Dominion Pacing final at Harold Park, Sydney, in front of a record crowd of over 50,000. The popular New Zealand horse beat the Australian champion Apmat and then survived a protest – a decision greeted with cheers from the unbiased audience. Also present were New York's Yonkers Raceway officials, who signed up Caduceus and his trainer-driver Jack Litten to compete in their planned international series. Prior to this, Caduceus had won the 1953 New Zealand Derby, the 1954 Auckland Cup and the 1956, 1958 and 1959 New Zealand Free-for-alls. He had also won major events in Australia against top competition and was narrowly beaten by False Step in the 1958 New Zealand Cup, giving the winner a 30-yard (27-metre) start. In America, Caduceus raced for another four years under lease, and ended his career with 53 wins and record earnings (for a New Zealand- or Australian-bred horse) of £116,000. He returned to stud in New Zealand and sired 18 winners, but was fatally injured in a paddock accident after only 18 months.